A Star Is Born, curiously, has been eclipsed by its successive versions. It is a bit of a shame given that this version, the original, is quite good, with some strong performances and an engaging story. Esther Blogett (Janet Gaynor) yearns to 'be somebody'. For her, to be an actress in Hollywood is her way to be something more than just a country girl. Her Granny (May Robson), a pioneer, gives Esther the money to go to Hollywood to follow her dreams, warning her that it is wonderful but not easy to pursue a dream. Esther arrives in Hollywood and soon finds discouragement everywhere. She can't find a job even as an extra, and soon she gets discouraged with everyone suggesting that she perhaps ought to return home. However, things take an unexpected turn when she meets Danny Maguire (Andy Devine), a second assistant director who becomes her best guy-pal. At a Hollywood Bowl concert, they see film star Norman Maine (Fredric March), sloshed almost out of his mind and making a spectacle of himself. Esther and Norman meet again when she reluctantly agrees to be a waitress at a Hollywood party. Norman takes an interest in Esther and believes she has what it takes to be a star. With that, he convinces/cajoles studio head Oliver Niles (Adolphe Menjou) to cast her opposite Norman in The Enchanted Hour, a costume picture. Niles also gives Esther a new name: Vicki Lester. Vicki becomes a star overnight, and she and Norman fall in love. They elope and appear to have an idyllic marriage, until Norman starts seeing his own career fading. His popularity is waning, and his alcoholism, mostly kept in check, is not helping. Eventually, Norman falls off the wagon, and at the worst time. Just as Vicki accepts an Oscar for Dream Without End, Norman, bombed out of his mind, shows up and interrupts her speech. He tells the audience he's won an Oscar himself, but now wants an award for giving the worst performance of the year. In other words, he demands a Razzie before they existed! In his stumbling, he accidentally slaps Esther, but she loves him all the same. Norman continues his downward slide, eventually arrested for drunk driving under his real name, Alfred Hinkle. Vicki offers to take responsibility for him, and he overhears her and Niles discussing Vicki's retirement from the screen to care for Norman. Devastated, he swims out to his death to spare her and save her career. Now, the Widow Maine decides to leave Hollywood permanently, but a visit from Granny reminds her that she didn't come to Hollywood to leave it. Rallying, she attends a premiere, where she introduces herself to the radio audience with, "This is Mrs. Norman Maine". A Star is Born is perhaps too economical in its telling (it should be noted that out of the four versions of this story, this version at one hour and fifty-one minutes is the shortest). As such, Esther's rise to stardom is remarkably rapid. Curiously, the only time we see 'Vicki Lester' actually perform is in a brief clip of The Enchanted Hour, which shows Gaynor looking very lovely but not particularly so extraordinary as to believe this one performance made people rave for her. That does not take away from Gaynor's performance, where she is winning and disarming as Esther/Vicki. Of particular note is when she and Robson say goodbye at the train station, a very tender and moving scene. Gaynor is extremely strong in conveying Esther's naivete and strength. She even manages to have a little fun when attempting to attract film producers' attention by doing impersonations of Greta Garbo, Katharine Hepburn and Mae West. It does make one wonder why Esther asking someone to 'come up and see me sometime' would convince anyone to cast her in a film, but why ask such questions. March, curiously, came across less as the drunk and troubled Norman Maine and more like a little boy: sweet and self-indulgent. He does have a fantastic moment when he overhears Esther's plans, acting with just his eyes the pain and sadness of seeing her sacrifice her career for him. However, in what is meant to be his big scene at the Academy Awards, he does not come off as being drunk but just angry. In fact, it seems that his career falters due less to a losing battle with alcoholism and more due to just plain public disinterest. In smaller roles, Menjou played Niles in a very sympathetic light, someone who genuinely cared about his stable of stars and wanted to do right by them. Devine added some moments of humor, though for long stretches he pretty much was forgotten. A good part was done by Lionel Stander as Matt Libby, the angry publicity agent who is delighted when he hears of Maine's death. "Where do I send congratulations to the Pacific Ocean?" he cackles, and while Stander can match Devine in unique voices, it seems curious that given how early on he seems to be a comic figure, he ends up being one filled with rage. Max Steiner's score at times signals things, particularly as the music swells when Maine takes his big swim. Still, it is quite effective. If there is a flaw in A Star Is Born, it is that we begin and end with a shot of the shooting script for A Star Is Born, as if reminding us that 'this is just a movie'. It takes us out of the film, and I don't think it was necessary. Minor quibbles, however, as William Wellman got strong performances out of his cast and kept the story moving, even adding nice bits such as when the hotel owner leaves a note for Esther threatening to throw her out for back rent only to tear it up. There were things I was puzzled about in A Star Is Born. 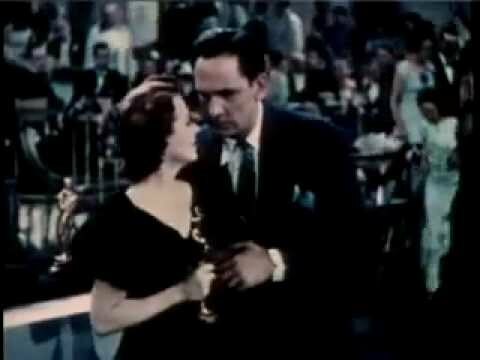 When Vicki looks at her Oscar, she begins to cry, but I wondered whether she cried for what it cost her in terms of her personal life or because she decided her career was over. Perhaps it was a mixture of both. Still, the 1937 A Star Is Born is a fine picture, a credit to all involved.